Sony/ATV Music Publishing as teamed with Belmont University’s Mike Curb College of Entertainment & Music Business for the “All Access” program, which will allow students to share their talent with the publishing company, and give Sony/ATV the opportunity to discover Belmont University’s potential songwriting talent. The program will allow students to have two songs reviewed by Sony/ATV Music Publishing’s Creative Team. The team then selects a limited number of students to perform their songs live for the Sony/ATV team during showcases held each semester. After the live performances, a limited number of students will be extended an invitation to attend a day in the Sony/ATV studio with an engineer. 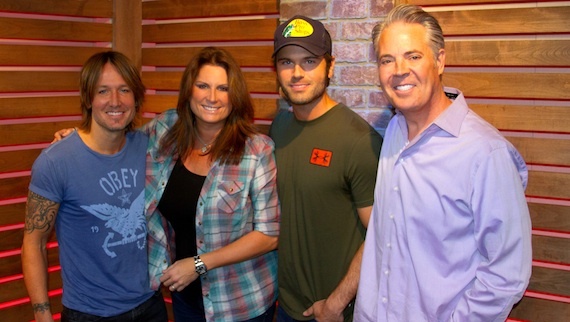 Keith Urban recently visited America’s Morning Show, with hosts Terri Clark, Chuck Wicks, and Blair Garner. 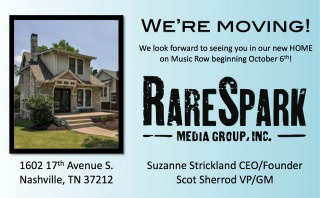 RareSpark Media Group is moving to a new location on Music Row, beginning Oct. 6. Suzanne Strickland serves as CEO/Founder, and Scot Sherrod serves as VP/GM. The new location is 1602 17th Ave. S., Nashville, TN 37212. All other contact information for RareSpark Media Group stays the same. 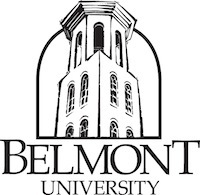 IPAC (Interested Parties Advancing Copyright) and Belmont University (Curb College of Entertainment and Music Business) will host an event on Monday, October 6th, 4:00-5:30pm at Belmont’s Columbia Studio A. The event will feature Congressman Doug Collins (R-GA), author of the Songwriter Equity Act of 2014, and Congresswoman Marsha Blackburn (R-TN) who will present updates of the U.S. Copyright Law Review and other legislative actions impacting songwriters and publishers, including a Q&A segment. Mr. Collins is a member of the U.S. House Judiciary Sub-committee on Courts, Intellectual Property, and The Internet. The event will also include special guests, including a brief songwriter showcase. Belmont University’s Columbia Studio A is located at 34 Music Square East. Parking is available in the lot behind (off of Music Cir. S) 34 Music Square East. You may enter Columbia Studio A from the back of the building. The event is free; however, guests should RSVP to copyright@clearboxrights.com.